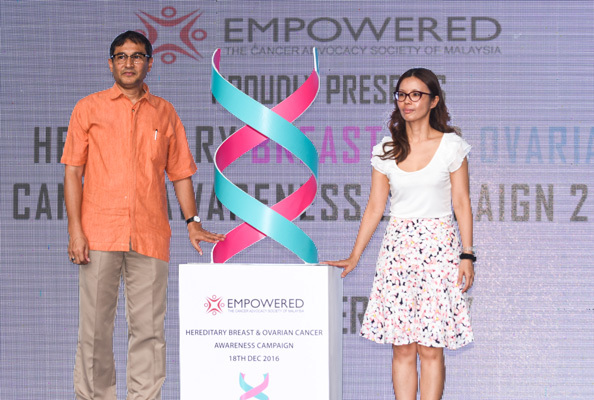 EMPOWERED’s Hereditary Breast & Ovarian Cancer Awareness Campaign 2016 is the society’s pioneer project on hereditary cancers, which comprises of 5-10% of all cancers. These cancers are due to mutated susceptibility genes and are inherited from one generation to the next. 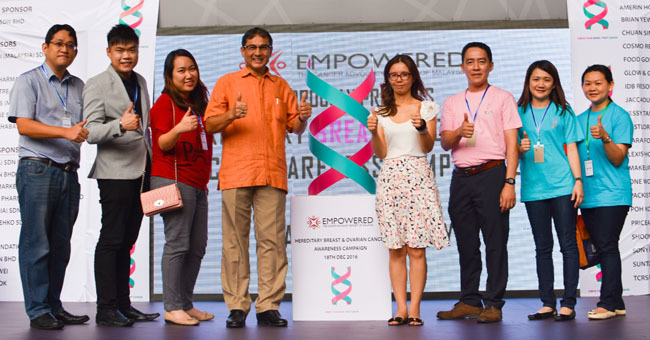 EMPOWERED hopes to raise the awareness of hereditary cancers, specifically Hereditary Breast & Ovarian Cancer (HBOC), to EMPOWER those Malaysians who carry a positive BRCA or other gene mutation, or have an important family history of cancer, to be more proactive about lowering their cancer risks and can take bold steps towards minimizing the impact of hereditary cancer. 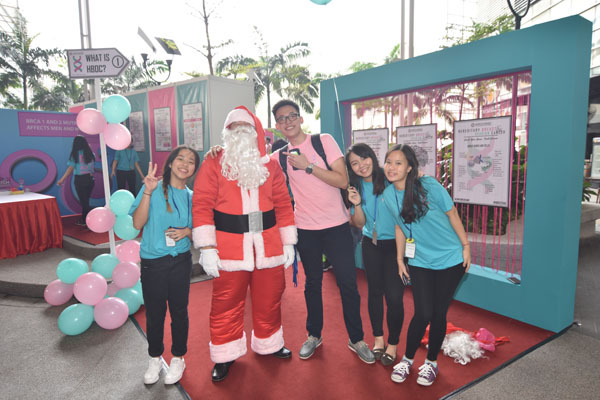 Petaling Jaya, Selangor (18th Dec, 2016) – Empowered, The Cancer Advocacy Society of Malaysia launched its first-ever Hereditary Breast and Ovarian Cancer (HBOC) Campaign at Paradigm Mall in Petaling Jaya. 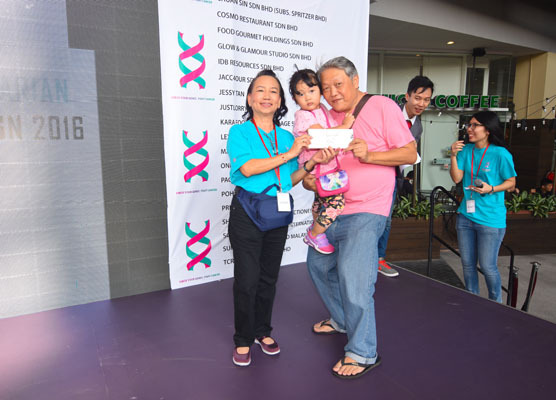 Bearing the theme of “Check Your Genes, Fight Cancer”, this Community Outreach Program aims to raise awareness about HBOC and recognize Malaysians who have been affected by hereditary breast, ovarian and related cancers, including women and men with BRCA mutations and individuals with a family history of cancer. Hereditary cancers account for 5-10% of all cancers and are due to mutated cancer susceptibility genes, such as BRCA1 or BRCA2. Hereditary Breast and Ovarian Cancer (HBOC) is a well-known inherited genetic condition and can be passed down from each generation to the next in affected families with a BRCA1 or BRCA2 mutation. People with a BRCA1 or BRCA2 mutation face a higher risk of developing breast and ovarian cancers by age 70 years than do women in the general population. People are more likely to have a BRCA1 or BRCA2 mutation if they or their close relatives on either their mother's or father's side of the family have had breast cancer before age 40 years, triple negative breast cancer, ovarian cancer, cancer in both breasts, breast cancer in a male relative, or multiple relatives with breast, pancreatic, or prostate cancer Through a thorough evaluation of a family cancer history, patients and families at increased risk for a HBOC can be identified, referred for genetic counseling and testing. Their health care specialists can help them make informed decisions about options for cancer risk reduction. According to Dr. Christina Ng Van Tze who is the President of Empowered, The Cancer Advocacy Society of Malaysia and Consultant Medical Oncologist, “Through awareness and education, Malaysians who carry a positive BRCA or other gene mutation, or have an important family history of cancer, can be more proactive about lowering their cancer risks and can take bold steps towards minimizing the impact of hereditary cancer. Empowered’s HBOC Campaign 2016 aims to raise awareness about the pertinent facts about HBOC and impact Malaysian lives”. 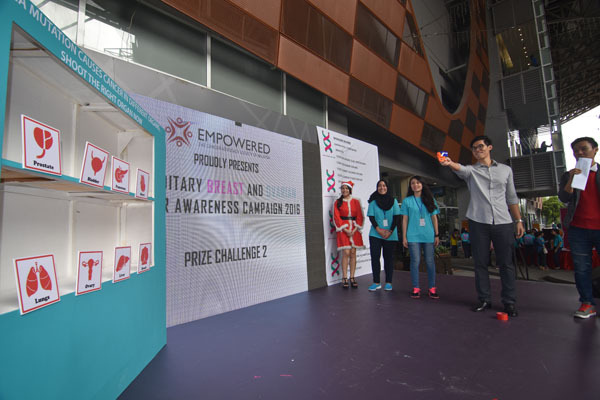 Empowered’s HBOC Campaign 2016 imparted a diverse array of creative learning experiences and medical answers to the Malaysian public. 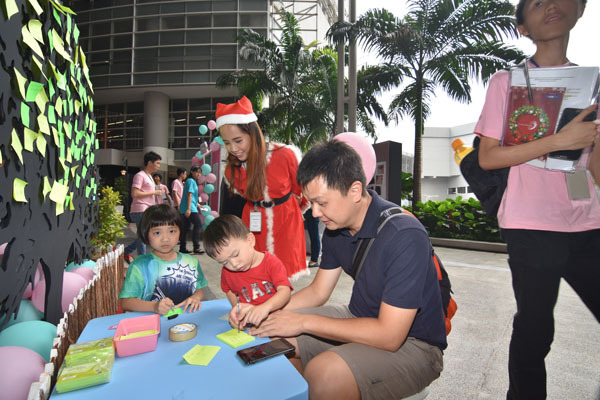 Paradigm Mall holiday shoppers were greeted by celebrity ambassador appearances as they journeyed between numerous learning booths (see below for details of learning booth messages) that were decked with family games and prizes. The HBOC campaign face and hair specialists as well as the event mascots brought much holiday cheer to the eager participants. 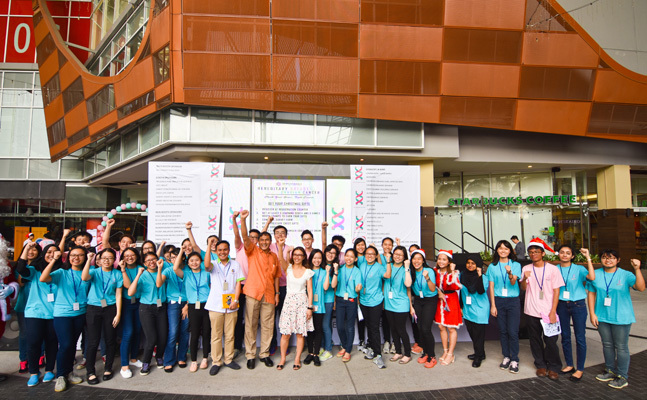 Empowered’s team of genetic counselors, doctors and medical students personalized the educational experiences of the Malaysians who were eager to embrace bold steps towards a healthier future. 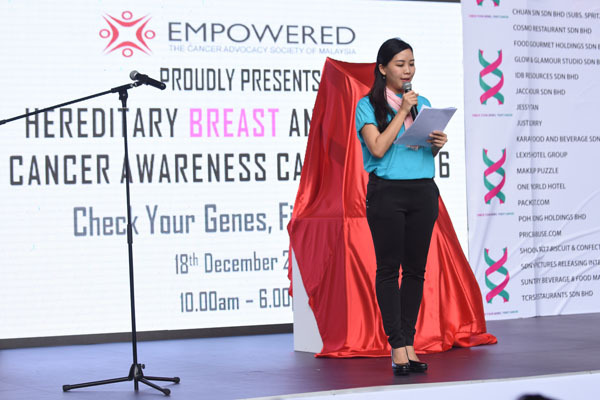 Dr. Ng continued, “Empowered celebrates the local and international efforts to ensure a better future for the next generation with continued work to improve medical options, accelerate research, make new therapies available to patients facing hereditary breast, ovarian and related cancers”. She also added, “Empowered is deeply grateful to local donors who have generously contributed to the HBOC campaign cause to positively impact Malaysian lives”. This booth provides an introduction to what cells and genes are. Our educators explain how cells become cancerous, the importance of genes, and how they contribute to cancer development. HBOC and the responsible genes, namely BRCA 1 and 2 are also covered in this booth. Booth 2: Who can be affected with HBOC? This booth explains who is at high-risk of HBOC. Our educators explain that both men and women can inherit faulty BRCA genes. Red flags for HBOC are covered in this booth. Booth 3: How are mutated BRCA genes inherited? This booth illustrates the mode of inheritance of faulty HBOC genes. When a parent is carrier of a faulty BRCA gene, each pregnancy will have a random 50% chance of passing on the faulty gene to the child. Booth 4: At what age might a person with a mutated BRCA gene get cancer? Booth 5: Which organs can be affected by cancer in mutated BRCA carriers? 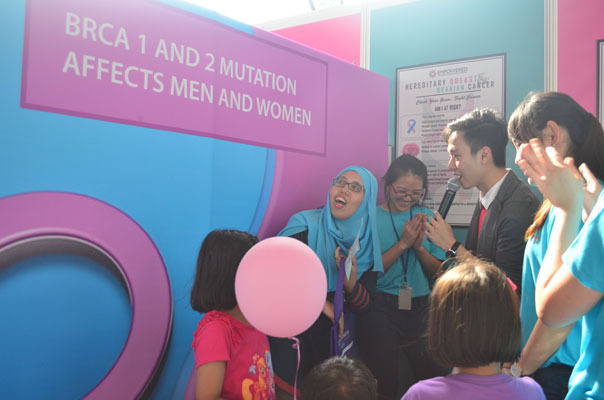 This booth educates people about the related cancers caused by faulty BRCA genes. 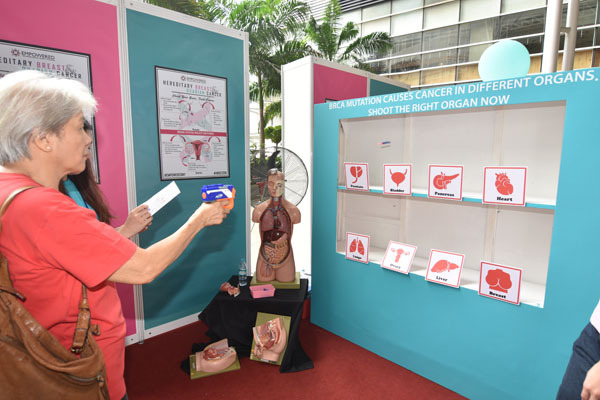 Our educators illustrate the different organs (affected by faulty BRCA genes) and where these organs are located in the body. Booth 6: Why is it important to know about our risk of hereditary cancers? This booth explains the importance of knowing your risk to HBOC. Our educators share the Angelina Jolie story, on how she discovered her high risk of developing HBOC, and what she did to reduce her cancer risk. Booth 7: What can I do if I have a high risk of HBOC? This booth covers the screening and preventative measures that are available to individuals who have a high risk of developing HBOC. Early detection saves lives. Our doctors takes groups of eagar women on enlightening tutorials about breast self examination. 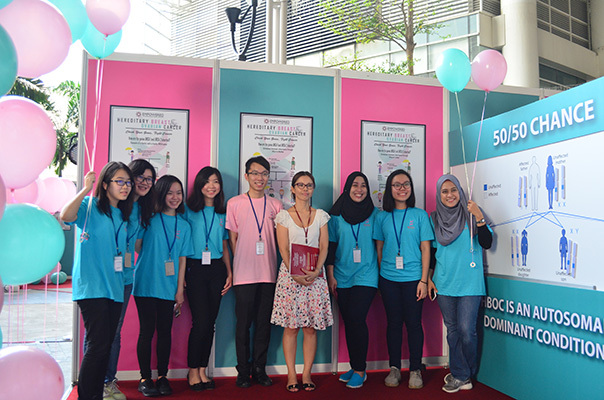 This booth focuses on helping people draw their family pedigree. Genetic specialists will address one family at a time. The family pedigree serves as a future reference for hereditary cancer risk assessment for each individual. The genetic counselors use the family pedigree and additional medical information to determine the individual’s risk of developing HBOC and if genetic testing is recommended for those individuals. 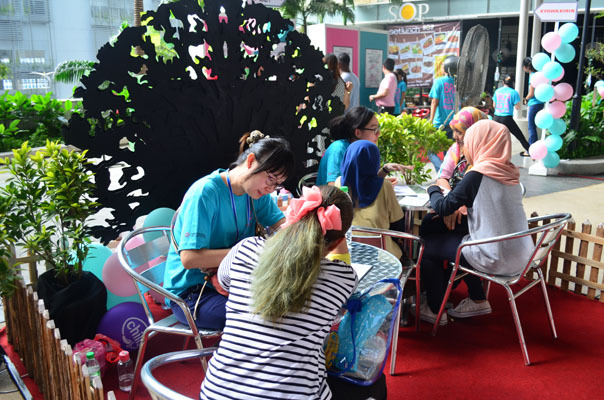 EMPOWERED, The Cancer Advocacy Society of Malaysia is a non-profit non-governmental tax-exempt organization. It was founded in 2009 by Dr. Christina Ng Van Tze to prevent cancer, save lives and eliminate suffering amongst the poor.